King’s Square isn’t somewhere I sit, but somewhere I pass by, pass through, on the way to Barnitts or Tullivers. There are usually people sitting on the benches. Which is perhaps why I’d never really noticed these small plaques. 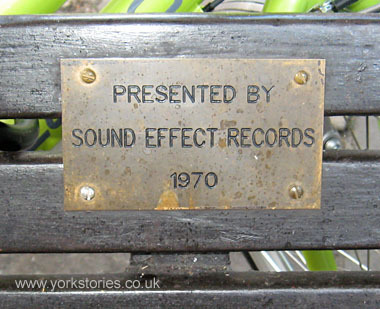 I went to King’s Square to look for the plaque placed by Sound Effect Records, after reading about it in the consultation documents on the planned changes. 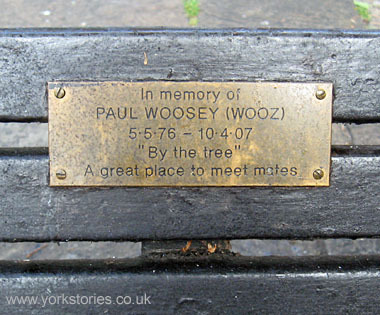 I looked at the other benches to see if there were other plaques, noticed the memorial to ‘Wooz’. And then of course there’s a plaque to mark the planting of the mulberry tree, which is to be removed from King’s Square for aesthetic reasons. The evening I took these the square was empty – a rare thing. So I sat awhile by the mulberry tree, in this triangle of a ’square’, with its triangle of brass plaques. There’s little opportunity to get ‘a sense of place’ in all the bustle and noise. You have to sit quietly. I had what I’d like to call some kind of epiphany, if that didn’t look so daft. I got it, at last, what this square is. It’s a place that holds things. Like a church does. Like the church once in the centre of it did. Or rather, like a house. It reminded me of a house with family photos on the mantelpiece. I was open-minded about the planned changes to this square. Into that open mind came the sudden conviction that the ‘reinvigoration’ will be an expensive and destructive mistake. Right. It is a special and unique place. Already. Because of these things added by people who cared. The council cannot impose ’specialness’. In fact they’re about to destroy it. No one I’ve spoken to wants this square ‘reinvigorated’. The plans for the square have been modified since the above was written. The mulberry tree is to be retained, and Paul Woosey’s plaque will be placed on a new bench. The reinvigoration [a loathsome word imo] of Kings Square is an act of vandalism, an act once done can never be undone. My grandma is Joyce Douglas, she planted the mulberry tree! Has the plaque been removed??? Hello Faith, the mulberry tree is still in the square, with the railings around, and so I assume the plaque is still there, as there would be no reason to remove it. But I’ll check for you. I’ve also sent you an email on the address you provided.